Today is the Feast of Saints Simon and Jude, two of the twelve Apostles. These two are among the least well-known of the Apostles. Apart from their names in the Gospel, there is very little we know definitely about these two Apostles. Simon is called either the Canaanite or the Zealot (Mt 10:4, Mk 3:18, Lk 6:15, Acts 1:13) by the evangelists. To distinguish him from Simon Peter, he is called Kananaios or Kananites (in Matthew and Mark) and Zelotes (in Luke and the Acts). Both titles come from the Hebrew qana, which means ‘the zealous one’ but some, like St Jerome, misread it as a reference to the town of Cana or to the region of Canaan. (This led to a story that at the wedding feast at Cana [John 2] Simon was the bridegroom!). The preferred reading in all the texts now is ‘Zealot’.‘Zealot’ may indicate membership of a strict Jewish sect. There was a party called Zealots famous in the war of the Jews against their Roman occupiers. They killed many of the nobility and filled the Temple with blood and brought ruin on their people. After Pentecost, Simon, like several other Apostles, is not heard of again in the New Testament. However, there is an abundance of legends about his subsequent life and final martyrdom. So one eastern source gives Edessa in Mesopotamia as the place where he died but a western tradition (represented by the Roman Missal and the Martyrology) affirms that he first preached in Egypt. He then joined his fellow Apostle Jude, who was in Mesopotamia, and they both went east to Persia. Here they were martyred at Sufian (or at Siani). In one story their throats were cut and in another Simon was sawn in two, like the prophet Isaiah. This tradition only dates from the 6th century, 400 years after the Apostle’s death, but devotion to him goes back much further. There is even a tradition that Simon got as far as Britain, perhaps Glastonbury, and was martyred in Lincolnshire. In art Simon is usually symbolised with a boat or a falchion (an axe-like sword), allegedly the weapon by which heathen priests cut him down. 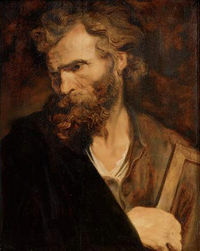 Jude, called “Judas, son of James”, is mentioned by Luke in his gospel (Lk 6:16) and in the Acts (Acts 1:13) and also in John 14:22 . He is commonly identified with Thaddaeus, who appears in the list of Apostles in Matthew and Mark, but where there is no mention of Jude. Some scholars believe he was a relative of Jesus. 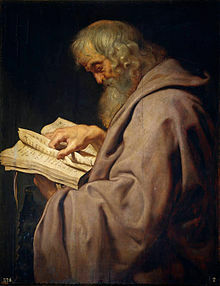 He is also believed to be the author of the Letter in the New Testament bearing his name. As with Simon, nothing certain is known of his life after Pentecost but again there are many legends. As mentioned, a Western tradition says that he joined up with Simon to preach the Gospel in Persia, where he, too, died a martyr’s death. In more modern times, Jude has acquired the reputation as the ‘patron of hopeless cases’, as attested by expressions of gratitude in Catholic devotional periodicals. The origin of this devotion is said to be that no one would pray to him because his name was so like that of the traitor Judas Iscariot. Only people who had tried every other option would in desperation turn to him! The relics of Simon and Jude are believed to have been brought to St. Peter’s in Rome in the 7th-8th century. Rheims and Toulouse also claim to have relics. In art Jude’s usual emblem is a club, the instrument of his death; otherwise he holds a ship, while Simon holds a fish. This is perhaps because, as a cousin of the Zebedee brothers, he was also a fisherman. This entry was posted in Uncategorized and tagged Apostles, Catholic, Christian, Feast Days, martyrs, Simon the Zealot, St. Jude, St. Simon, Thaddaeus. Bookmark the permalink.